Logistics Bureau Play – “Is Your Supply Chain killing your Business”? Many senior business managers fail to appreciate the key drivers of Supply Chain Health and Performance and still more lack an appreciation of the sometimes complex inter dependencies that exist in the Supply Chain. This presentation whilst highly entertaining, carried some serious lessons based on real life case studies and experiences. It illustrated the often unforeseen issues that can occur within the Supply Chain that can seriously impact the Health of the Business and highlighted some of the early warning signs and interventions that can be made to avoid disaster. Smart Conference Delegates gained some real practical tips on maintaining the Health of their Supply Chains. A short and at times harrowing play. LB Foods is a $4 Billion public company that has grown rapidly over the last 10 years. Recently its performance has suffered and its share price has been falling for the last 12 months. Yesterday the share price plummeted to an all time low. We are a fly on the wall in the Emergency Department of Darling Harbour General Hospital as doctors fight to save the life of LB Foods. 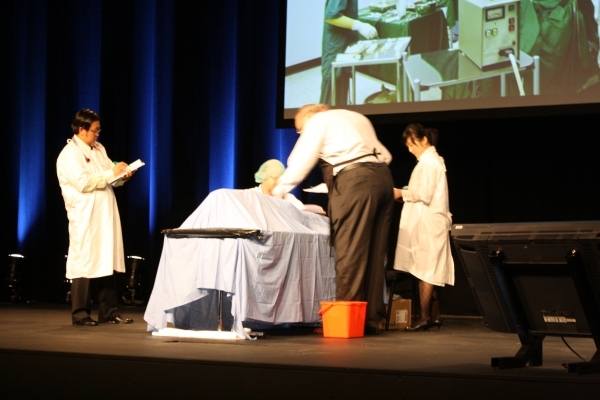 A distraught Managing Director paces the waiting room and is questioned by the Head Surgeon as to how his business came to be in its current state, whilst a team of medical staff try to diagnose the problem and prevent the death of the business through a range of tests and emergency interventions. Will the business survive? This presentation involved Logistics Bureau staff along with those of a key customer (THP Vietnam).